Twin Spin - Play for free and keep your winnings on Twin spin! 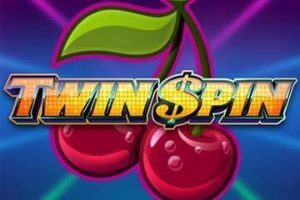 Twin Spin a classic fruit video slot with a twist! Just one month after releasing Starburst, NetEnt followed up with another mega-hit game called Twin Spin. The game was released in November 2013 and to this day still receive an impressive amount of game rounds. You’ll often see the game title in the winners feed of online casino and the social media website are always booming with big winner stories on this title. 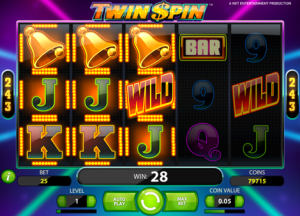 Twin Spin is a classic video slot with a modern twist to it because it has remarkable animations and an engaging soundtrack. Which let’s face it is quite rare when it comes to fruit machines games. When you play this slot you’ll always be on the edge of your seat as the reels inflame themselves. The game has 2 different modes to it, the fun mode where you can witness its magic by playing with 5,000 fun coins or the real cash mode to truly experience the excitement this game can deliver. Twin Spin is available on a desktop, mobile and tablet in a wide array of online casinos. The game runs really smoothly regardless of the browser or device you choose to play on. This classic game has 5-reels and 3-rows, it is also a 243 ways to win slot. You can play this slot for as little as 25p per spin and up to £50. The default coin value of 25p can easily be increased by upping the 10 bet level the game offers. There’s also a whopping 270,000 coins up fo grabs! A cool feature of Twin Spin is the synchronising reels, and it’s possibly why this game became so successful. When you play Twin Spin you are always guaranteed to have at least one set of twin reels. But, there’s also the possibility that these twin reels will expand to triple, quadruple or even quintuple reels! It does happen quite frequently that players hit 15 matching symbols because of this feature. The RTP (return to player) is set at 96.6%, which is quite high for a classic slot. Like most NetEnt games this one gives you the possibility to auto-spin and customise the stop feature. You can choose to play a defined numbers of round or automatically stop the reels after a certain win amount or when you balance increase or decrease by a given amount. These advanced settings are available in the desktop, mobile and tablet version of the game. They are 12 different feature symbols in this classic slot and surprising no scatter. The Wild symbol is clearly identified as Wild and will substitute all symbols. The best-paying symbol is the diamond and 5 of them will give you 1,000 coins. The second best paying symbol is the lucky 7 and 5 of them will reward you a handsome 500 coins. The Bar is the third best-paying symbol and 5 will give you 400 times your initial bet. Five gold bells and/or 5 red cherries will give you 250 coins. The royal suit of Ace, King, Queen, Jack, ten and nine is also present on the reel. 5 Aces, kings and Queens will win you 40 coins. The lowest cards of the royal suit pay at equal value and 5 of them will give you 25 coins. Twin Spin is quite unique in its genre but some of its features can be found in other games. If you enjoyed the synchronised reels feature of Twin Spin you should consider playing Nirvana by Yggdrasil Gaming which also offers it in the bonus round. Nirvana is a beautiful game where you’ll have the chance to win up to £10,000. The RTP (return to player) is set at 96.2%. You can play Nirvana for as little as 20p and up to £100 per spin. If it’s the classic Las Vegas style of Twin Spin you’ve enjoyed, well you’re really spoiled for choices but the best ones in our opinions are. Joker Million also by Yggdrasil Gaming, because it has recently made a multi-millionaire when a lucky player placed a €2.50 bet and won the record breaking amount of €3.3 million. Joker Million can be played for as little as 25p and up to £25. This game also has very good features like freeze reels and re-spins. While this slot does offer synchronised reel the animation and game symbols are similar to Twin Spin. Plus, it has the added benefit of offering a progressive jackpot. Neon Reels by iSoftBet truly stand out when it comes to classic video slot. The reels disposition mimic a classic slot but also has a tonne of amazing animation. Neon Reels too offers a progressive jackpot which can be won instantly when 5 or more jackpot symbols lands on the reel. 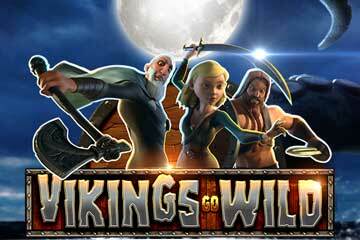 Other features of this stunning classic game include free spins, re-spin and freeze reel. If we’ve managed to pick your curiosity and you wish to try any of the games we’ve mentionned in this review we recommend you play it at Hello Casino, Rizk Casino or Casumo. These casinos offer amazing welcome bonuses to new players and also have a solid reputation for fast withdrawals. Rizk invites new players to join an adventure of a lifetime with a generous 200% bonus up to £100. When you play at Rizk casino you’ll always have double the fun as you’ll have access to captain wheel of rizk where you can win free spins and bonuses! 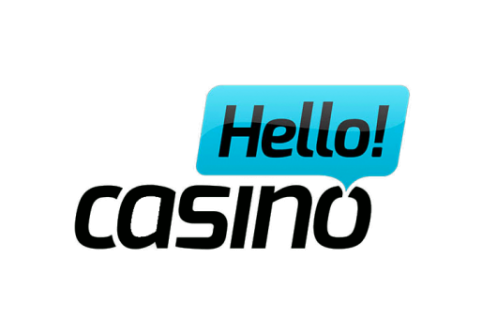 HelloCasino offers a very smooth signup to new casino players who wish to claim a 100% bonus up to £200. Casumo is a gamified casino where new players will be taken on a journey across multiple worlds, and have the chance to earn trophies based on their game achievement. 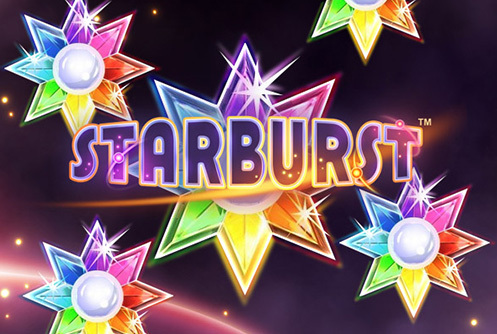 It’s a really fun casino and new players can enjoy a 200% bonus up to £50 and 180 free spins in starburst! As you can see you have plenty of choices of great casinos when it comes to playing this amazing hit game! Have fun!